Passion for food happens in various ways. Chuck Shin is the founder and owner of two craft beer retail stores in Seattle. You’ve probably visited or at least driven past one or both locations. Chuck’s Hop Shop started in 2010 with its first location in Greenwood and a second store added later in the Central District. Then there is Jason Jacobs. A plumber by trade, but a barbeque enthusiast at heart. One day Shin decided it was time to branch out beyond beer and came up with the insane idea of opening a restaurant, utilizing Jacobs talents for slow cooking meats. In September of 2017 he became part-time beer meister/part-time restaurant owner and Jacobs went from plumber to pit master. A year later the amalgamation of the pair is working quite well at the corner of 80th and Roosevelt in Seattle’s Maple Leaf neighborhood. Seattle has seen a lot of barbeque come and go over the years, so to stand up to legends of now and the past, there has to be a home run somewhere in the menu. Jacobs nails it with his 3-4 hour smoked ribs and 9-13 hour brisket. Other proteins on the menu include turkey, sausage and pulled pork shoulder. The quality of the meats makes a big difference. Barbeque Smith gets their meats from Swift, a company that sources from local ranches. You won’t find a lot of fat here, instead you’ll find meaty ribs, brisket, shoulder and more. Don’t believe what some will tell you, that the flavor is in the fat. In good meat, the flavor is in the meat. It doesn’t need excess fat to shine. And with good meat, you won’t be searching for a toothpick at the end of the meal. No toothpick required after dining here. And while proteins need to taste good all on their own, especially those smoked, sauces can sink a bbq joint if they don’t stand up to the flavors imparted by the smoking. The sauces here make the restaurant sail with flavorful offerings of mild, hot and extra hot. Try them all, and fear not, the extra hot won’t cause a melt-down in your mouth. You can still taste after it hits your tongue. Sides round out the menu and include pork & beans, mac and cheese, coleslaw, collard greens and a most delicious potato salad. In an Asian twist, Shin’s mother arrives once a week to make up a batch of southern style kimchi. Sorry – the recipe is a secret. What’s missing? Cornbread. C’mon guys – we need some cornbread! 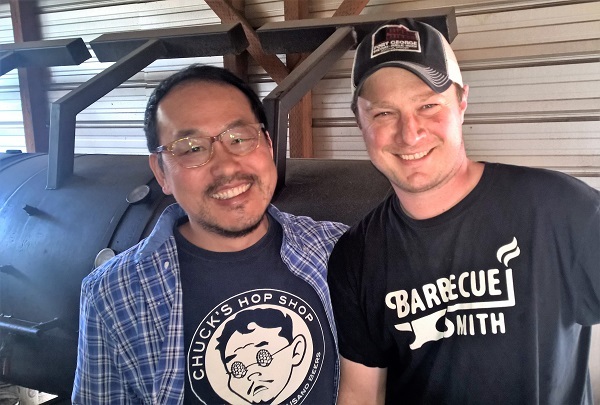 Shin’s beer connection bodes well at Barbeque Smith. With 23 beers on tap at all times, there’s something for everybody. That would include a host of micros from sources all over the west coast. But it gets better. Shin crafts his own brews, then commissions a local micro crafty to make up a batch. As an example, October will see one of his brews arrive from the nearby Georgetown Brewing Company. As September slips away, his Proper Glassware IPA is slipping away – an excellent summer blend commissioned to Matchless Brewing out of Tumwater. Delicious. But if beer is not your thing, there’s also whiskey and wine in the house. As you may well know, Maple Leaf has quite a few families in the neighborhood. Adult guests can feel good knowing they can escape the kiddies by retreating to the lounge in the back. When asked what the biggest learning curve has been the first year, the duo agrees – it’s figuring who the customer is. 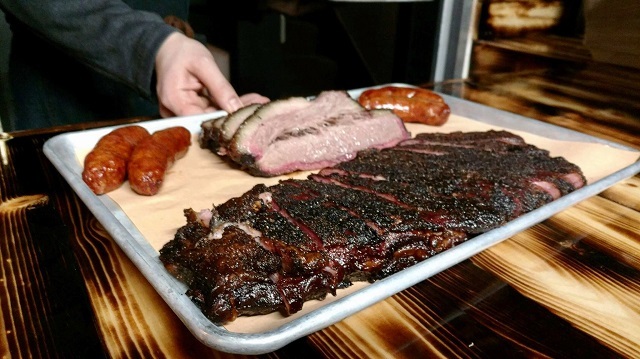 Hours have changed over the months to accommodate more lunch service, eliminate closed days entirely and getting what goes in the smoker just right so you don’t overdo it or run out by 7 p.m. About 50% of their business is take-out. And speaking of smokers, connoisseurs want to know, what’s in the pit? Jacobs relies on two smoking setups – an offset smoker and a cabinet smoker. The ribs and sausage go in the cabinet, while the brisket, pork shoulder and turkey go in the offset. Jacobs smokes with a 50/50 blend of oak and hickory. While the cabinet is wood fired, it features a thermostat that kicks in gas if it drops below 275. That’s one reason these guys are currently sporting an “Excellent” rating from the King County Department of Health. What’s in the future? Currently there are no plans for a second location, but Barbeque Smith has begun a catering service. You can also look for them at nearby neighborhood food events. But to be sure, your best bet is to make the trek to Maple Leaf and sink your teeth into some of the best ribs we’ve ever experienced in Seattle. Previous Sunday Specials are on the way!